'Who is FIFA threatening to boycott? 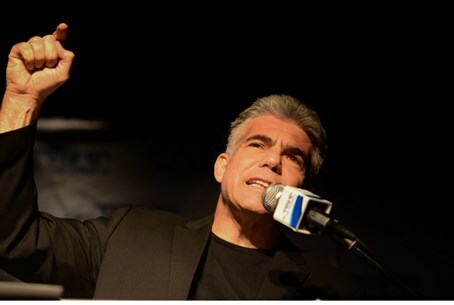 Not human rights violators Iran, Syria, or Saudi Arabia, but Israel,' Lapid lashes out on Facebook. Yesh Atid chairman Yair Lapid lashed out Thursday morning at FIFA, shortly after a vote scheduled for Friday on ousting Israel from international competitions was postponed. "Who is FIFA threatening to boycott?" Lapid charged on his Facebook page, before listing a number of countries who have far worse track records than the Jewish state. "Syria - a quarter of a million people dead, four million refugees, government using poison gas against civilians, the wholesale murder of children." "Iran - brutal suppression of the Sunni minority, executions, financing terror throughout the world, violent repression of women, the elimination of homosexuals, the only country in the UN openly threatening to destroy another country (us)." "Saudi Arabia - dozens of executions per month. Eritrea - thousands of prisoners detained without trial and appallingly tortured in prison. Sudan - thousands of people dead, two million displaced," Lapid summed up. But FIFA is actually conducting a discussion on the possibility of banning Israel, Lapid continued, in an angry critique of the double standard the Jewish state is held to in various international arenas. "Israel - the only country whose army warns its enemies before bombings, maintains international law even when a terror organization fired indiscriminate missiles on it last years, and its minorities sit in parliament and have equal rights." "This is not only hypocritical, it's madness," the Yesh Atid chairman slammed.